For the time being, our books available only through Lulu.com. See our publisher storefront there to browse our full line. For ten years (1954-1964) John T. Frye wrote a story every month in Popular Electronics, about two teen boys who used electronics to help other people, foil criminals, impress girls, and get out of jams. Better still, Frye explained the technology that Carl and Jerry were working on, and in doing so inspired countless Boomer teens to pursue careers in science and technology. This fifth and final authorized anthology contains 20 stories, from the years 1963-1964. All the original b/w illustrations are included. Perfect bound, 6" X 9", 196 pages. 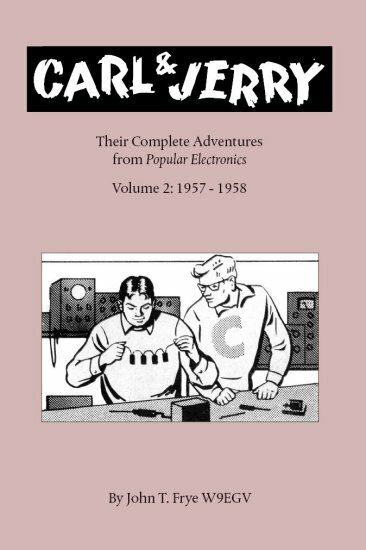 For ten years (1954-1964) John T. Frye wrote a story every month in Popular Electronics, about two teen boys who used electronics to help other people, foil criminals, impress girls, and get out of jams. Better still, Frye explained the technology that Carl and Jerry were working on, and in doing so inspired countless Boomer teens to pursue careers in science and technology. This fourth of five authorized anthologies contains 24 stories, from the years 1961-1962. All the original b/w illustrations are included. Perfect bound, 6" X 9", 196 pages. 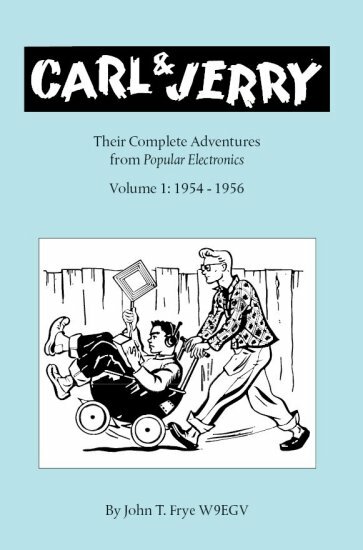 For ten years (1954-1964) John T. Frye wrote a story every month in Popular Electronics, about two teen boys who used electronics to help other people, foil criminals, impress girls, and get out of jams. Better still, Frye explained the technology that Carl and Jerry were working on, and in doing so inspired countless Boomer teens to pursue careers in science and technology. This third of five authorized anthologies contains 24 stories, from the years 1959-1960. All the original b/w illustrations are included. Perfect bound, 6" X 9", 190 pages. For ten years (1954-1964) John T. Frye wrote a story every month in Popular Electronics, about two teen boys who used electronics to help other people, foil criminals, impress girls, and get out of jams. Better still, Frye explained the technology that Carl and Jerry were working on, and in doing so inspired countless Boomer teens to pursue careers in science and technology. This second of five authorized anthologies contains 24 stories, from the years 1957-1958. All the original b/w illustrations are included. Perfect bound, 6" X 9", 190 pages. For ten years (1954-1964) John T. Frye wrote a story every month in Popular Electronics, about two teen boys who used electronics to help other people, foil criminals, impress girls, and get out of jams. Better still, Frye explained the technology that Carl and Jerry were working on, and in doing so inspired countless Boomer teens to pursue careers in science and technology. This first of five authorized anthologies contains 27 stories, from the years 1954-1956. All the original b/w illustrations are included. Perfect bound, 6" X 9", 208 pages. Fantasy, 8,500 words. Two centuries-old witches in modern-day Chicago must seek help from a young mathematics student when they realize that all their powers cannot save their unborn son, who while still in the womb has been given a mission and a challenge by the community of whales in Earth's oceans: Save the wounded soul of humankind, or die. Available in ebook format only: HTM, RTF, TXT, PDF (Adobe Reader), and LIT (MS Reader), all delivered in a singler ZIP file. No DRM of any kind. Sold under the Digital Household License: May be legally copied to any digital device based in your home; PC, smart phone, PDA, ebook reader, anything. When Pope Pius IX declared himself infallible at the First Vatican Council in 1869, clergy and theologians across Europe cried foul. After reconciliation proved impossible, tens of thousands of European Catholics broke with Rome and formed their own independent national churches. These "Old Catholics" pledged to maintain the traditions of the ancient Catholic Church against the "New Catholicism" of the Pope and the Roman Curia. Written pseudonymously by James Bass Mullinger in 1874, this book is the only known eyewitness account of the formation of the European Old Catholic churches from the perspective of the Old Catholics themselves. Unavailable for well over a century, this new edition is not a holograph reprint but has been rescanned, re-edited and completely reset, with a modern index and table of contents.